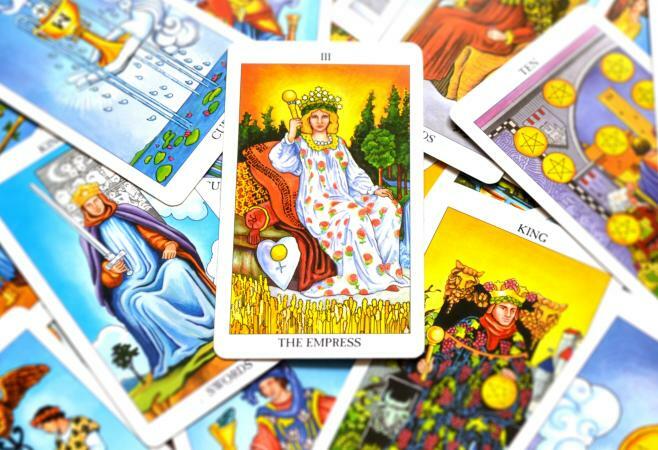 In decks based on the Latin Tarot (also called the Tarot de Marseilles), the Empress is the fourth card of the major arcana. When she appears in a reading, the Empress has rich symbolism that can provide important information to the querent. Although she is the fourth card of the major arcana, the Empress is numbered III (3) because the first card of the major arcana, The Fool, is numbered 0 (zero). On the card, the Empress is represented as a pregnant golden haired woman. She sits outdoors in a field of golden wheat stalks on a throne covered in red cushions. It is clearly summer as evidenced by the golden light in the card, and behind the Empress are verdant trees and a river flowing into a waterfall. Her head is adorned with a crown of 12 stars, and in her right hand, she holds a golden scepter topped with a sphere. She wears a loose-fitting, flowing white gown decorated with sliced red pomegranates and a pearl necklace around her neck. Her throne is adorned with Venus symbols, and its cushions sit above a heart-shaped shield also adorned with the symbol of Venus. Because she is a major arcana card, when the Empress appears in a spread, the querent is advised to pay special attention to her message. She comes after the High Priestess, a symbol of wisdom and learning, and before her partner the Emperor, who symbolizes male power, authority, and balanced partnership. In numerology, three is the number of creation and two opposites coming together to create a new third. Reduced numerology of the 12 stars in her crown also becomes three (12=1+2=3), reinforcing this theme. The 12 stars are also suggestive of other significant numbers, such as 12 months of the year or 12 hours on a clock face. Her clothing is loose and flowing, suggesting she is ripe with pregnancy. While the Rider-Waite-Smith deck doesn't obviously depict pregnancy but rather suggests it through her clothing and other symbolism, other decks depict the Empress as being visibly pregnant. Pregnancy is a time of creation, fertility, ripeness, and creative potential. The white of her dress suggests purity, while the pomegranates on her dress represent fertility and creativity. The 12-starred crown on her head represents authority and rulership. This headdress also indicates the joining of heaven and earth, as the stars are representatives of heaven but are here on Earth on the Empress' head. The symbol of Venus appears multiple times on the card. This is the symbol of femininity and also of love and marital bliss. That it is printed on a heart-shaped shield and cushions represents love, protection, and comfort. The wheat suggests a time of prosperity after a ripened harvest as well as nourishment. Wheat also represents seeds of creativity waiting to be sewn. The waterfall and river represent abundance, prosperity, and emotion. She is seated on red cushions, which also hold deeper meaning. They suggest comfort and passionate love. Summer is a time when everything ripens and grows to abundance. Therefore, it is reinforcing the theme of abundance on the Empress card. A scepter is a phallic symbol, representing male fertility while the sphere represents the feminine. 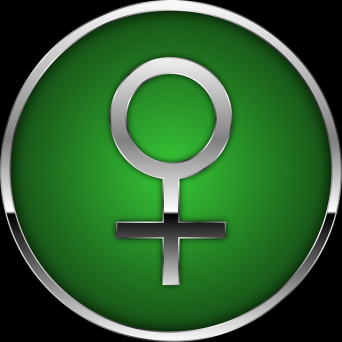 Therefore, this symbol represents the coming together of masculine and feminine aspects to bring about a period of creation. When you combine the rich symbolism available on the Empress major arcana card, you can arrive at her meaning in a spread. When she appears, the Empress suggests a time of richness, abundance, prosperity, creativity, comfort, and passion is upon you or will soon be. She represents happiness and security, as well as emotional support, fertility, and passion in all aspects of life. When reversed in a spread, the Empress may foretell of financial or marital strife, lack of creative fulfillment, or a creative dry spell. She may also suggest impaired fertility. Like all major arcana tarot cards, the Empress is richly symbolic. The images on her card evoke prosperity, abundance, creativity, and fertility, so when she appears in the upright position in a reading, it is a sign good times are upon you.